When the weather gets hot, you probably want to dive into a pool and splash around until the sun sets. But there are days when all you want is just to kick back, close your eyes, and relax until you fall asleep. A summer must-have for everyone is a hammock. Hammocks are the epitome of summer and relaxation. When the world is on your shoulders and you feel like your day just couldn't get any worse, simply lie back on your trust hammock, close your eyes, and sway to your heart's content. The problems seem to go away within just a few minutes on a hammock. But don't you wish you could enjoy your trust hammock during the impending cold days, too? Don't you wish you can also lie back, relax and sway for hours during the cold months of winter? Since human beings' creative and inventive minds never cease to amaze us, you now can do exactly that. 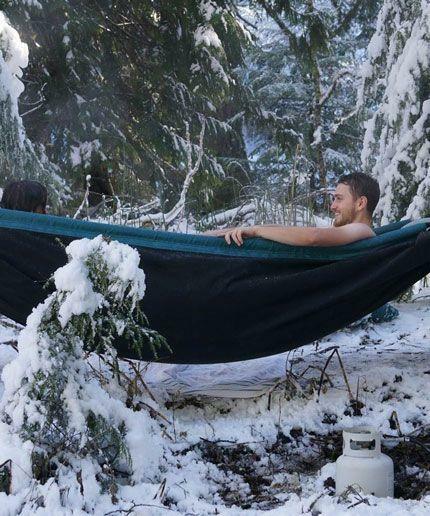 The Hydro-Hammock is a hammock and hot tub combined into one. According to the website, it's "made from waterproof high-tensile strength marine quality canvas." It's completely portable, just like any other hammock, and can be used anywhere. "Enjoy indoors, outdoors, even on the beach with fresh or ocean water and the ability to fully stretch out," says the site. Refinery29 describes it as "a more comfortable, portable bathtub; more refined than a kiddie pool, but more portable than a Jacuzzi." What luxurious way to live. Unfortunately, luxury comes at a price. 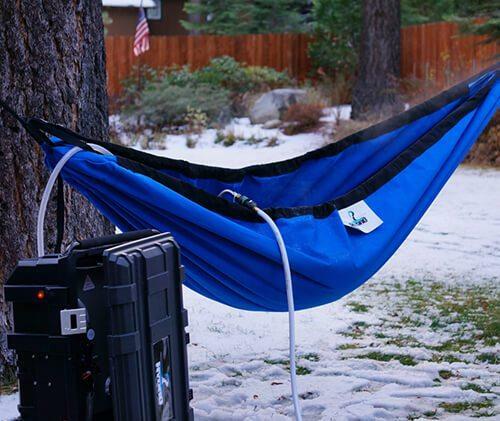 The original Hydro Hammock, "light and portable while still being ultra durable," costs $360. But if you get the package that includes easy set-up straps, cam jams, carabiners, instructions, and a water heating system, you pay a total of $1,395! Even crazier is the Deluxe Hydro Hammock package, which is pretty much the same as the regular Hydro Hammock package, except you get a double-layered hammock, which "can be opened to add insulation for extremely cold climates or even add water between the layers for a swinging water bed."